Bold designs that recall a home nation or favorite destination. Available on dozens of styles of t-shirt, polo shirt, sweatshirt and more, each with a wide choice of colors. 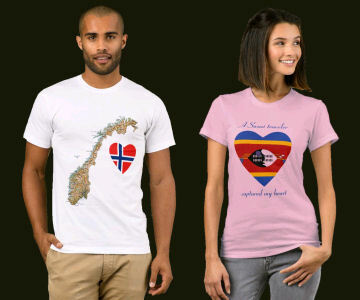 Wear FlagAndMap apparel and travel in style or fly the flag when far from home. FlagAndMap designs are available on a variety of other items including accessories, homeware, stationery and office products. Browse our selection to find the perfect gift for a friend or loved one from abroad. 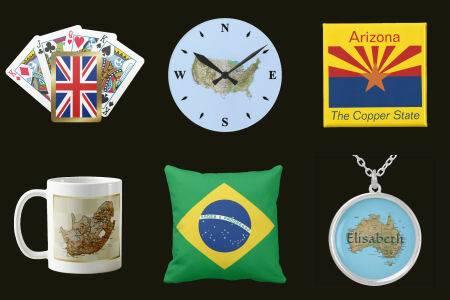 Other products include: mugs, bags, cards, wallets, keychains, magnets, pillows etc.